Every few months, I see an article pop up about another city creating or planning for a “bicycle super highway” where cyclists can zoom along unimpeded in a wide separated path with the same comfort that we provide to drivers. There’s one in Copenhagen that stretches 22km to connect areas outside the city core and then there’s the planned 29km bike super highway in London, England. Do we have any in Toronto? 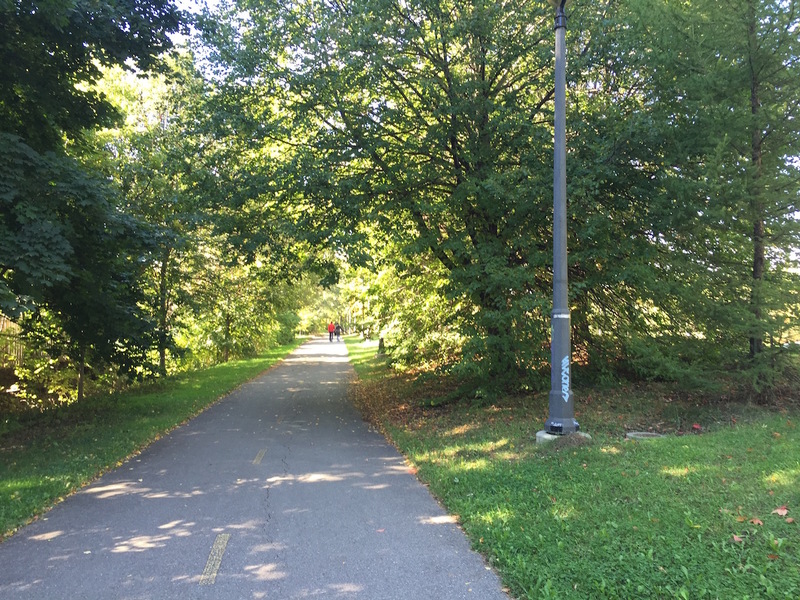 I suppose some of the paths through the ravines—like the Lower Don Trail, which stretches from the lakeshore all the way up to roughly Eglinton, is a kind of superhighway–however, these pathways are really billed as recreational trails rather than commuter trails. There is little access into and out of them to surrounding roads. But then there’s Route 22. I discovered Route 22 while searching on Google Maps for parks to visit in Ward 4. That’s when I saw the little grey squiggle running underneath Eglinton Avenue from Scarlett Road to Highway 427. Route 22, I learned, is an entirely separated cycling pathway that runs parallel just south of Eglinton for a total of about 5km. The irony is that the reason there was room to put in Route 22 during this section of Eglinton is that the roadway was widened in anticipation of the Richview Expressway—an expressway that was cancelled in the 1960s. 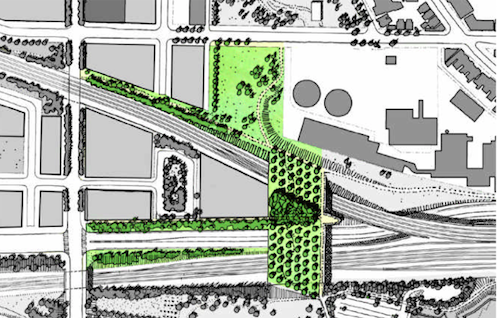 So we did get an expressway, it’s just one for cyclists. It’s also prettier than a regular expressway. Below is an example of what it looks like when Route 22 crosses a major street. There is a red strip that indicates the trail connection across the roadway. But the best part about Route 22 is that it actually seems to go somewhere. We have some great trails in Toronto, but they’re often severed, ending at the edge of a park. Lines on a map doesn’t make a cycling network. It’s the connections between those lines that matter. 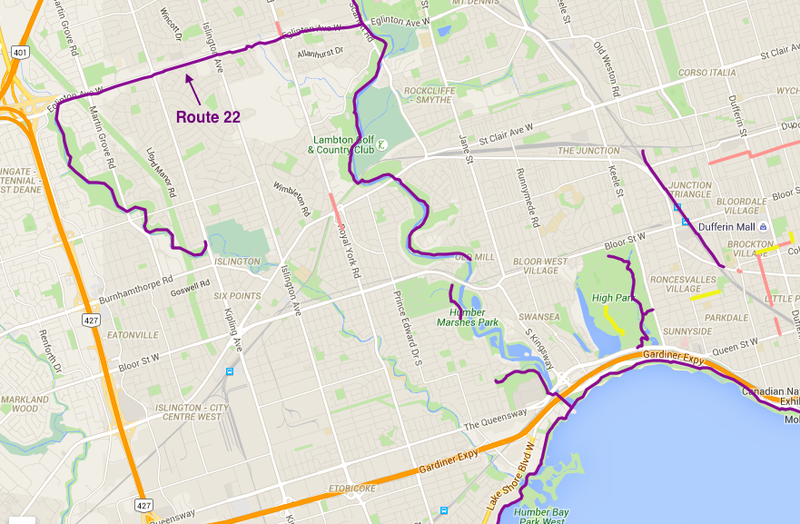 On Route 22, you can ride west where the trail seamlessly links (see title image) with the West Dean Parklands, which has Mimico Creek running down its centre. 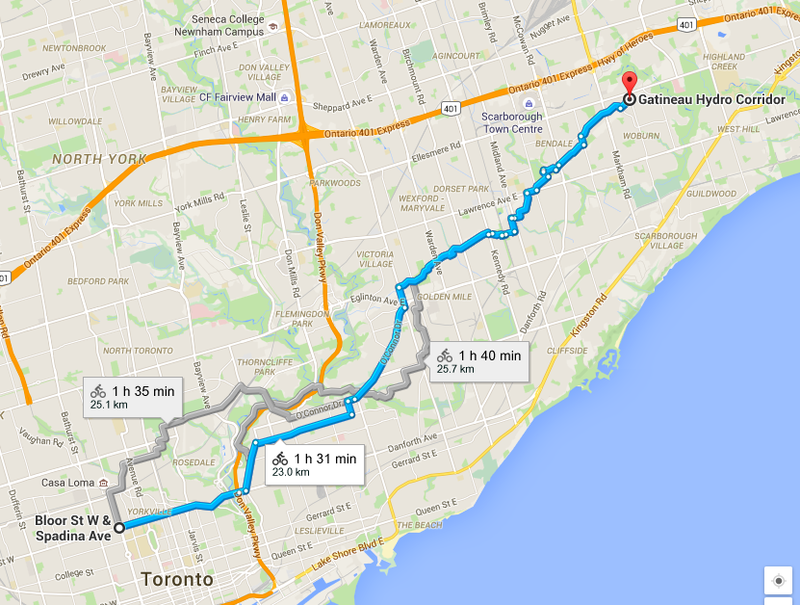 From there you can ride another 4km south where the trail ends near Burnhamthorpe and Kipling. On the east side, Route 22 links in with the Humber River trails which take you up to Steeles or south to the Martin Goodman Trail, which you can take both west to Mimico or east to the Beach. This starts to look like–gasp!–a trail network. OK, so Route 22 is not going to find itself included on any top ten list of bicycle super highways (or probably even 20), but it’s perhaps one of the closest things we’ve got in Toronto. It was one of those beautiful Fall days near the end of September where summer seems to be hanging on by its finger nails that I decided to finally bike the Scarborough butterfly trail that threads its way through part of the Gatineau hydro corridor. I’d wanted to check it out for some time, seeing as it was one of the big projects funded in 2013 under the Weston Family Parks Challenge, the grant program that Park People administers. But, well, it’s a bit of a bike from where I live. There were a few ways I could go, some a bit more scenic than others, but I decided to choose the most direct route, since my ride was already going to be 1.5 hours one way. 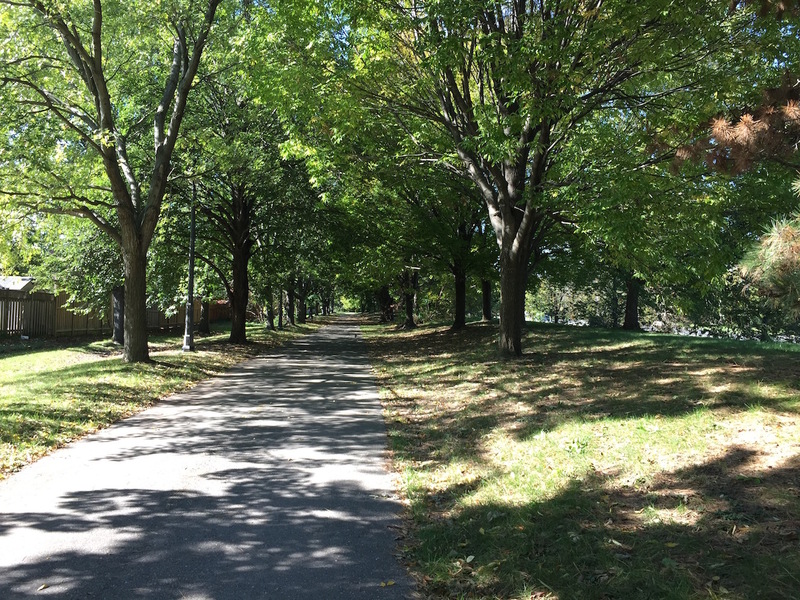 I biked through parts of East York and then entered the hydro corridor where the trail starts at Victoria Park. 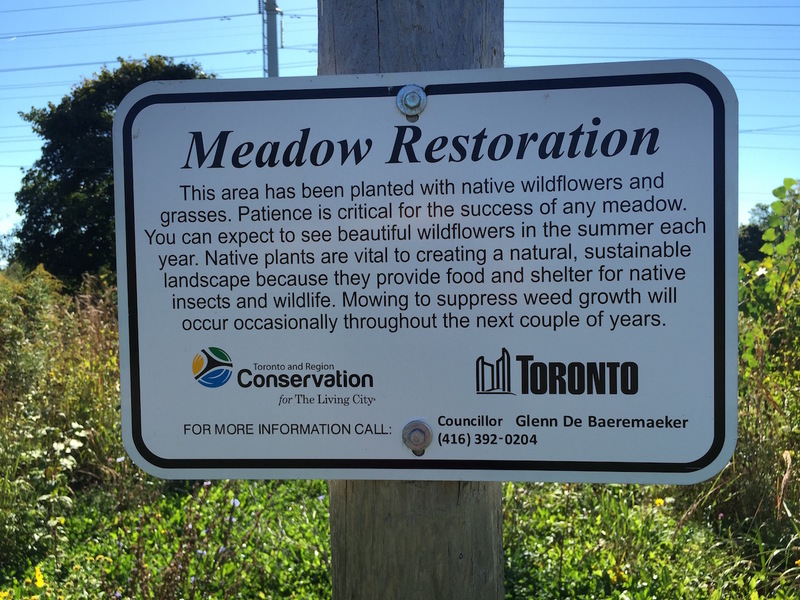 The Toronto and Region Conservation Authority (TRCA) is the organization that led the creation of the butterfly trail, working in partnership with the City of Toronto who licenses the land in the hydro corridor for recreational trails. 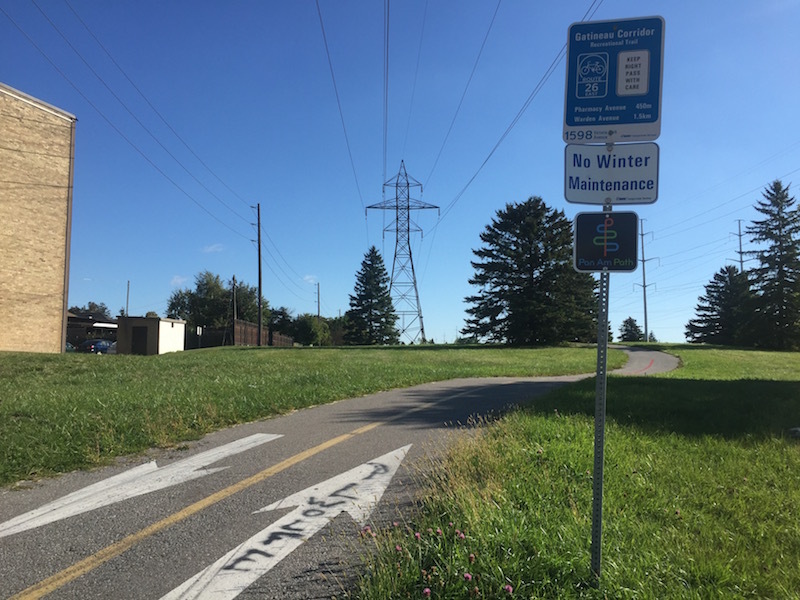 The butterfly trail consists of a naturalized native wildflower meadow along a 3.5km stretch of hydro corridor trail, where normally there would just be mowed grass, that runs from McCowan Road to Scarborough Golf Club Road. But even without the butterfly meadow, the trail is well worth a visit. It’s not often that I can hop on my bike in Toronto and zip around off-road for kilometre after kilometre, but that’s exactly what you can do in the hydro corridor. Aside from one stretch where the trail diverts to residential streets, the entire trail is separated from the street. 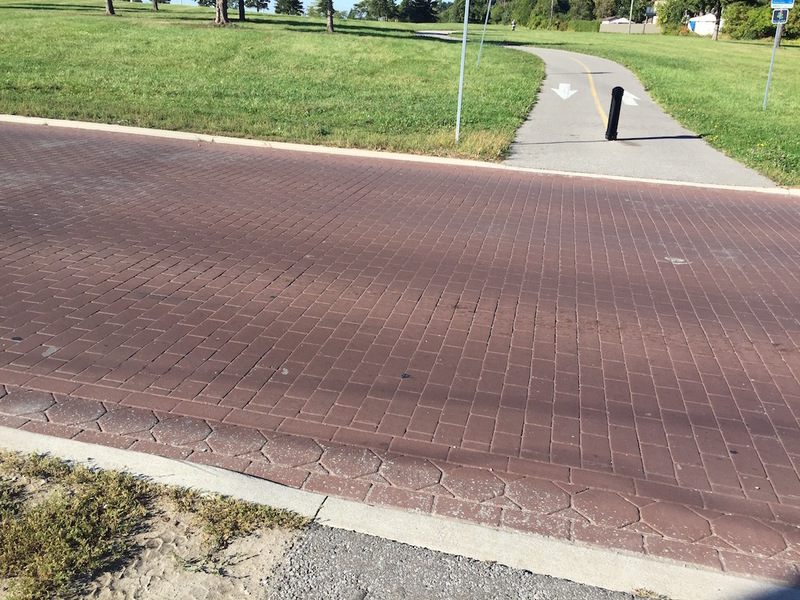 Where the trail crosses major roads there’s even a nice bike light for you and where there are minor roads the City has paved the crossings in brick which helps alert cars that this is more of a shared space. It’s a nice touch. Wish this was found in more places in Toronto. The butterfly meadow, however, makes a huge difference. I found myself biking slower without even realizing it. The smell in the air changed to be somewhat sweeter. The sounds also changed. Far more buzzing. I saw a few butterflies, but more bees lazily floating around. Not so with the butterfly trail. I saw people jogging, walking their dog, or just out for a stroll. The meadow makes the huge expanse of the hydro corridor feel more intimate, and there’s always something to look at as well. 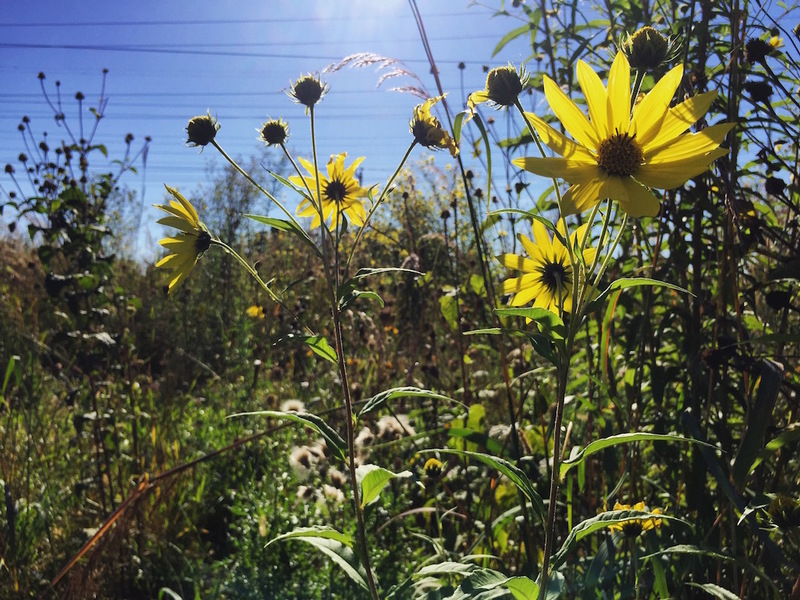 It just makes so much sense to create these native wildflower meadows in our hydro corridors. Better for nature and biodiversity, but also better for people.